Tips & Tools: Read Me First! 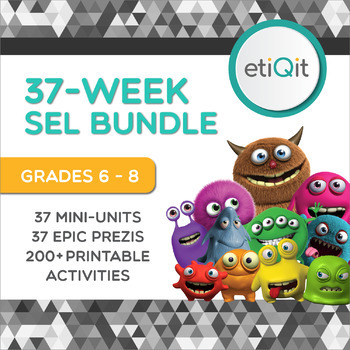 This social emotional learning (SEL) and mental health mega-bundle includes 37 robust mini-units (called Qits) which feature both face-to-face and online strategies students can use to improve their learning, relationships, mental and emotional health, and personal safety. Each Qit explores a specific social emotional strategy with a sleek, content-rich Prezi in two formats (printable and projectable) as well as five one-page printable activities. In total, you'll receive 37 Prezis and 220+ content-rich student printables in this bundle! Use one Qit per week (in any order you choose) to last an entire school year OR use the activities in each Qit over time as your schedule allows. This bundle was designed to give you ultimate flexibility to use Qits in any order and to accomodate any schedule, so it's easy to make it work for you! Teacher Qit Planner: This spreadsheet includes a full list of all 37 Qits and the key concepts each one teaches as well as the American School Counselor Association (ASCA) and Collaborative, Academic, Social, and Emotional Learning (CASEL) standards aligned with each Qit. There's also a notes section for you to track which Qits you've taught and when. Index of Qit Concepts: This alphabetical listing of SEL and mental health topics will make it easy for you to find the Qits which address the concepts you want to teach. Qits Calendar: You can use the Qits in any order you choose, but if you'd like inspiration for how to schedule your Qits throughout the school year, this month-by-month guide is here to help. While all of the Qits are thoughtfully and sensitively designed for students in grades 5 through 8, a few Qits do address more mature topics. Specifically, Qit 14 and Qit 15 contain sensitive content about sexuality, and Qit 2 addresses suicide. 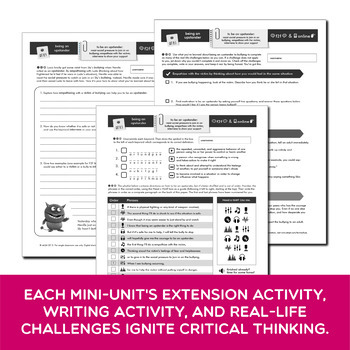 Please scroll through all the included Qits in this bundle prior to purchasing to be sure they will be a good fit for you and your students. Prezi: Choose from either an exciting projectable Prezi (Internet connection required) or a one-page, content-rich printable. Both formats include a three-step strategy (broken down with in-depth examples and details), vocab words and definitions, a writing activity, and more — all wrapped up in a sleek, eye-popping design featuring bold colors and modern graphics to appeal to tweens and teens. 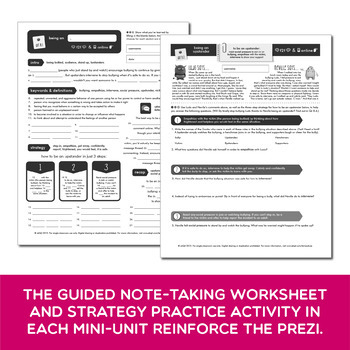 Worksheet: This short-answer printable can be used as a guided note-taking companion to the Prezi OR after the Prezi as a review, group activity, homework, or a quiz. So flexible! Strategy Practice Activity: Students dive deeper into the strategy they learned in the Prezi by analyzing the dialogue between two characters called Goobs. The Goobs endear themselves to students through their use of relatable and comic language sprinkled with pop culture lingo as they struggle to solve a social-emotional problem or conflict. Extension Activity: Designed with unique, attention-grabbing themes, this activity will keep students engaged as they apply and extend concepts learned in the Prezi. Writing Activity: Relatable questions challenge students to reflect, think critically, and demonstrate the concepts they've learned in this printable activity, which is perfect for assessment. Real-Life Challenges Activity: By completing a checklist of real-life challenges, students will apply the concepts they've learned throughout the Qit to their own lives so they may practice and experience the strategies in action. This activity bridges the gap between classroom learning and real life by encouraging students to independently seek opportunities to apply the strategies they’ve learned in order to make sound and healthy decisions for themselves. Answer Key: Super organized and easy-to-use, this guide includes everything you need! Instructions for Use: This resource includes basic instructions for use and is designed to be low-prep and user-friendly. But if you *love* details (like me!) and want more ideas and tips on how to get the absolute most out of this resource, these links were designed just for you: Video Tutorials on how to open, navigate, and present your Prezi; an awesome Printable Teaching Tips Guide which highlights the key features of each material and provides teaching tips and discussion questions; an FAQ Page for quick access to answers; and even a fun, one-minute video to introduce etiQit and the concept of social emotional learning (SEL) to your students. A Prezi is a digital slide presentation similar to a PowerPoint, but equipped with much more exciting viewing features such as zooming, turning, and perspective-changing, which students tend to love! To keep things super simple, a web link and password to access your Prezi online are included in the PDF you download with this resource — which means no enormous Prezi file or additional software to download, just a link to click. An Internet connection is required to view the Prezi, but that’s it — so easy! If you’re nervous about using Prezi for the first time, I’ve got you covered with Video Tutorials on how to open, navigate, and present your Prezi. Not tech-savvy? Not a problem! My Prezis are designed to be intuitive and easy to use, even for people who’ve never tried a Prezi before. Please note that while the Prezi is full of exciting colors, graphics, and rich content, it is non-editable and does not include sound. PS — Have you seen this Harvard University study which found Prezis to be more engaging, persuasive, and effective than PowerPoint?? Check it out! My goal is for this resource to being fresh, meaningful learning to your classroom, so please contact me if you have a question or problem. I’m super responsive to email and always try to reply within a couple hours. Thanks for giving me the opportunity to help! Hi! I’m Jen. And I created etiQit, where you'll find a fresh, modern approach to social emotional learning (SEL). My resources are perfect for teachers of specialty subjects (such as counseling and guidance, health, life skills, character education, special education, and speech) as well as general classroom teachers looking for low-prep, easy-to-implement SEL activities. Students will be hooked by the infusion of technology, social media, apps, music, and pop culture in etiQit materials, all of which foster an interactive SEL experience designed to promote the social emotional health and personal safety of young people living in a digital world. Thanks for joining me on a mission to advocate for emotionally healthy students, safer schools, and a better world through SEL!